Those exposed to the ferocious heat ray sustained serious burns. 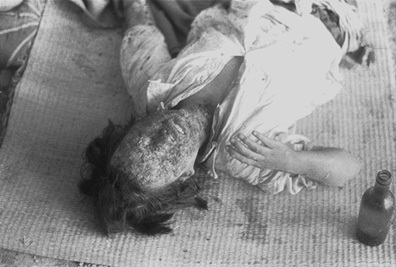 Skin exposed directly to the heat ray (with nothing to shield it) within roughly 1.2 kilometers of the hypocenter was burned to black char. Even internal organs were affected. Virtually everyone burned in this way died immediately or within a few days. All rights reserved by the Asahi Shimbun. 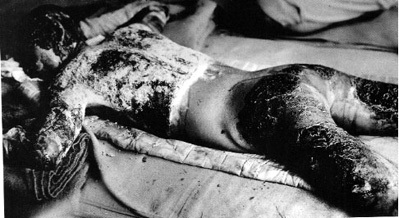 This man exposed within a kilometer of the hypocenter was critically burned over his whole body except where his waistband covered him. 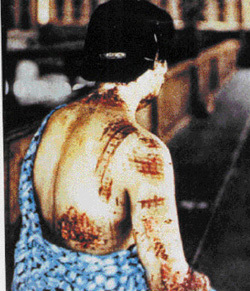 ●This woman's kimono pattern was burned into her skin. Because dark colors absorb heat more readily than light colors, the heat ray burned the dark parts of this woman's kimono pattern into her skin. The heat ray scorched and blackened the asphalt, but it remained white where the bridge railing blocked the rays.